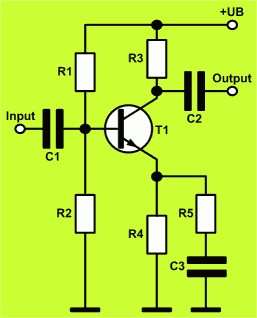 The common-base circuit is needed most for the design of radio frequency applications. For designing an amplifier in common-base configuration, open TransistorAmp software and click on New Amplifier - Common-Base circuit. Here you can see the schematic of the common-base circuit with NPN transistor (left) and with PNP transistor (right). 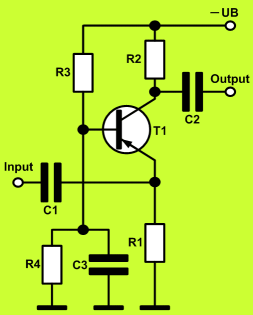 The common-emitter circuit offers current gain and voltage gain, and requires a complicated calculation of the component values. For designing an amplifier in common-emitter configuration, open TransistorAmp software and click on New Amplifier - Common-Emitter circuit. Here you can see the schematic of the common-emitter circuit with NPN transistor (left) and with PNP transistor (right), where the emitter resistor is partly capacitive bypassed by C3 and R5. Thereby, the circuit is able to deliver a high gain, and it has a stable bias point. This means, changes of temperature have only small impact on the bias point. 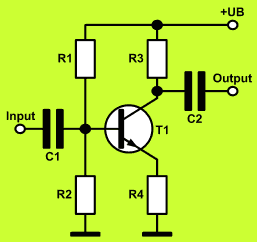 If the desired gain of the common-emitter circuit is not very high, the capacitive bypass of the emitter resistor can be omitted, so the circuit can be simplified. TransistorAmp detects automatically, in which cases that simplification can be made, and chooses the apropriate schematic. Here you can see the schematic of the simplified common-emitter circuit with NPN transistor (left) and with PNP transistor (right). 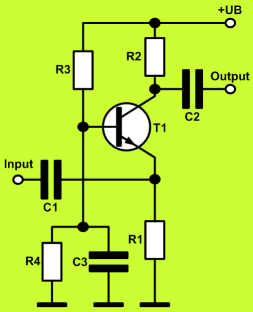 The common-collector circuit offers a high current gain, and outputs the input voltage nearly unchanged. Thereby, a load of lower impedance can be connected to the output of the circuit. 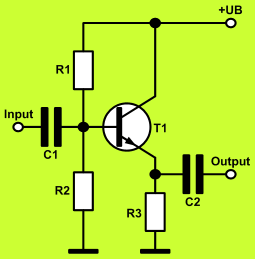 That is the reason why the common-collector circuit is also called an impedance converter. Here you can see the schematic of the common-collector circuit with NPN transistor (left) and with PNP transistor (right).